In our centers, you can enjoy the game and win big prizes! So come down to our centers and participate in our exciting Guess & Win Lucky Draw for Russia FIFA World Cup 2018. Only two weeks more to go before we know the winner! Simply show receipt or photo of receipt which have spending of 10,000ks in any Junction Centre including Junction City! Just scan QR Code of any football team you support to get a chance to win the Lucky Draw. The winner will get to win a trip to Bangkok (5pcs), Junction Gift Card value 40,000ks (50pcs), and CB Visa Prepaid Card value 20,000ks (50pcs). 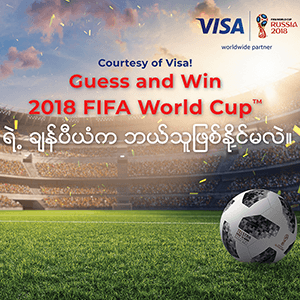 2018 FIFA World Cup Guess & Win will end on July 15 at all Junction Centre including Junction City. Let’s enjoy the game and win prizes with Junction!